Recently, I found myself recalling one particular evening a few years ago. I can’t remember if my friends and I were celebrating something or if it was just another night out, but we had gone downtown for a fun evening. We probably went for dinner between 8 and 10:30 and then went out for drinks and dancing. At about 3:30am we found ourselves at Fran’s Diner having – oh I don’t know – probably something like gravy laden open-faced turkey sandwiches or grilled cheese sandwiches. (That sounds about right for 3:30 in the morning!). My friends keeled over laughing. 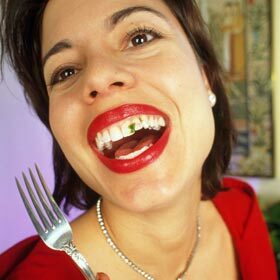 Turns out they had been looking at the spinach in my teeth all night. At first it was just spinach, not a big deal. Then as time passed they each kept expecting the others to pipe in and reveal what was becoming an awkward issue. Then, as time passed, they didn’t know how to bring it up – as if it was getting more embarrassing for them to acknowledge that they hadn’t said anything. As for me – OMG! We had met so many people! We were having a great night so I’m sure all evening I was smiling a big toothy spinachy-smile. I was mortified, not to mention super annoyed with my friends. Where was the trust? Where was the respect? That night reinforced the value of starting hard conversations. If we find ourselves only telling each other what we WANT to hear then we run the risk of never telling each other what we NEED to hear. Just because a conversation will be awkward or difficult doesn’t mean we should avoid it. This example is trivial but the lesson applies to many of our bigger more important conversations. At work and at home, great relationships and partnerships take work; we cannot take them for granted. Information is power but you’ll never know unless you ask or are (respectfully) told. Change is inevitable in every environment and that change has to be coordinated among those involved. This means that while someone might have been doing something right yesterday, they may need to be told that they have to adapt and keep up today. Some conversations do require some bravery, not to have them – but to start them. Most people are not comfortable being told that they require some redirection or that what they are doing isn’t quite right. As well, people who need to communicate this information are often not keen on delivering what can be sensitive or upsetting news. When receiving difficult (awkward, critical or disappointing) information it’s important to remember that it was almost never intended to hurt you. The intention was to keep us all informed and moving towards our goals. I’m fascinated by communication – how easy it should be, but how hard it often is. Throughout my book The Power of More and particularly in my discussion of Teamwork and Leadership I write quite a bit on communication. Recently in my presentations, communication features as one of the four pillars to the concept that if you want to finish happy you need to start happy. I really do believe that starting hard conversations – by asking, listening and/or contributing – is the key to clearing through all the chaos and clutter of our busy and ambitions lives and closing the gap between where we are today and where we want to be in the future. In the coming weeks, I’m going to be fleshing out more of my thoughts on communication; how we listen to and deliver critical feedback. Until then, if you see someone “flying low” – be sure to tell them. This entry was posted in Mentor Messages and tagged communication, starting hard conversations by Marnie. Bookmark the permalink. Marnie, having Trusting relationships sometimes means having what we consider tough conversations. Sometimes we think they are harder they actually hard. Thank you for reminding us of that.